Making your own cushion covers is cost-effective, fun and rewarding. We make foam for cushion on daily basis here at GB Foam. Whether that’s for a new set of sofa cushions or something comfy for a window seat. As we only cut the foam for cushions, we thought it would be fun to teach you how to make your own cushion covers at home. This is a relatively simple guide on how to make envelope cushion covers to sit alongside your sofa. The first thing you’ll need is a pillow form. You may already have a set of cushions in need of a cover. If you’re looking to make your own pillow form though, you may want to consider filling it using our foam crumb. Foam crumb acts a great cushion stuffing and we sell three different mixes of it. You can choose from our high-density foam crumb mix, memory foam crumb mix or a 50/50 blend. All our foam crumb is made using only new foam offcuts. Once you have your pillow form, you’ll need to choose a fabric to make your cushion covers with. There are plenty of places to buy fabric both online and in store. We personally recommend looking at the fabric in person to ensure that it’s the right one for you. Remember, the way the fabric feels is just as important as the way it looks. As well as fabric you’ll also need some basic sewing supplies and a sewing machine. Once you have everything, you’re ready to begin making your own cushion covers. To create envelope cushion covers, you’ll be folding one long piece of fabric to create both the front and back. The ends of the fabric will overlap by around 3 inches at the back when completed to help ensure that your pillow form is hidden when the cover is fitted. The image template above may help you to visualise this more clearly. In order to calculate the measurements of your fabric piece, you will first need to measure your pillow form. Double the measurement both front and back then add 6 inches for the overlap and hem. For a seam allowance, we recommend adding half an inch to the top and bottom. Fold over the edge of the fabric a quarter of an inch on both sides to create a hem. Press the fabric down and fold a quarter of an inch once again. Once done, straight stitch along both hems to hold. Next, lay the fabric down with the inside pattern facing upwards. Fold the left and right side to create a square, positioning the overlap to your liking. Pin the seams in place. Now stitch along the top and bottom seams leaving half of an inch allowance. Finally, turn your cushion cover inside out and insert your pillow form into it. You now have a new pillow to sit on top of your sofa cushions. Repeat this process as many times as you wish until you have all the pillows you want. Now that you have new pillows to go on your sofa, why not upgrade your sofa cushions? Here at GB Foam Direct, it’s easy to order replacement foam for your sofa cushions. We cut foam to exact sizes meaning all you need to do is change over the cushion covers. We even fit dacron for better loft and stockinette to make it easy to put the foam into the cushion covers. 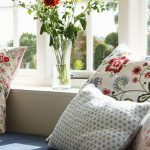 Take a look at our how to measure sofa cushions guide if you’d like to know more about taking the right measurements for sofa cushions.